14th Gujrat Vidhan Sabha elections will be held in November of 2017 just after Himachal Pradesh elections. Bhartiya Janta Party is ruling state from last 15 years. But this is first time in fifteen years when situation is becoming difficult for BJP in state as three young leaders with Congress yuvraj Rahul Gandhi. Hardik Patel is one of the most popular young Patel community leader fighting for reservation in Gujrat. Hardik Patel became a big Patel leader after 2015. Gujrat government tried their best to stop his reservation movement but was not successful. There is just 12% vote share of Patel Community in Gujrat but for BJP this 12% is very important. 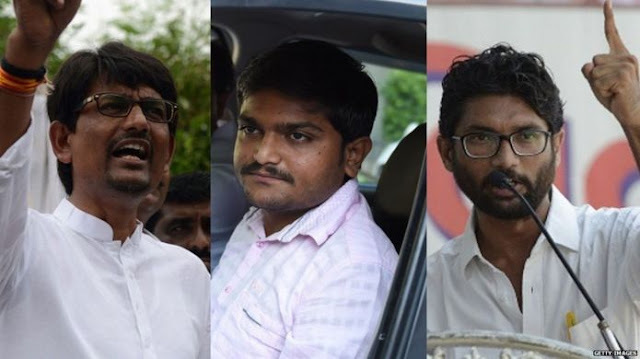 Hardik Patel is key leader in upcoming elections, BJP is continuously working to get support of Patel Community but unable to impress Hardik Patel. Hardik Patel is not going in congress party but regularly contacting with Congress party and Rahul Gandhi to influence in upcoming elections and to make things difficult for Bhartiya Janta Party. Jignesh Mevani is another young leader of Gujrat. Jignesh Mevani is social activist and lawyer. He work for organisation 'Rashtriya Dalit Adhikar Manch'. He has led campaign by Dalits, considered 'lower castes' in the Indian caste hierarchy in Gujrat. In a movement named as 'Aazadi kooch aandolan' he was able to join Dalits/lower caste people as well as Muslims. He blamed BJP for bad condition of Dalits in state Gujrat. Mevani clearly said he will not join congress in upcoming elections but he wants to let BJP down in 2017 Gujrat VidhanSabha elections. In Gujrat population of Dalit votes is around 7 percent and every vote will be very important in upcoming elections and Jignesh can create problems for BJP. Alpesh Thakur is considered one of the biggest OBC leader in Gujrat. He had become one of the best young leader of Schedule caste, schedule Tribe and other backward classes in state. He had fought continuosly for rights of backward classes and minorities. He blamed BJP for bad condition of minorities in state and blamed Bhartiya Janta party for no action against bad condition. He recently joined congress party and said 25 lakhs people said him to join. Congress party. These three leaders will make a difference in upcoming elections , and will be interesting to show how they can stop Modi wave in state where Vikas (Development) is always on priority rather than local issues or community issues.